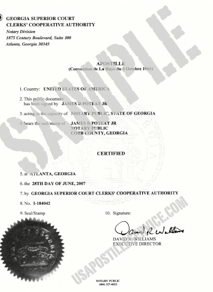 Apostille only validates the signature, official seal, and authority to act of a state of Georgia notary public or certain state of Georgia local or state officers. Apostille does not validate the contents, completeness, or accuracy of the notarized or issued document. The authentication process includes matching the signature and seal with the information on file with the Notary Division of the Georgia Superior Court Clerks’ Cooperative Authority. Documents must be originals or certified copies with pen-in-hand signatures of notaries public or public officials. Documents signed by certain local or state officers must bear the original signature (signed by hand in ink) of the public official and be sealed with the official seal of said official. These type documents include marriage records, birth and other vital records, court documents, and corporate documents. School transcripts must be signed by an issuing official of the school in the presence of a notary public. The notary cannot act as the issuing official and the notary for a transcript document. A Georgia notary public is prohibited from making certified copies of publicly recordable documents which include: deeds, mortgages, and other instruments dealing with real estate, vital records, birth certificates, marriage records, divorce decrees, powers of attorney, probated wills, student records or transcripts from public schools, colleges or universities, military discharges, Uniform Commercial Code documents, court pleadings, documents marked “filed” or “recorded”, most documents retained by a government office, Certificates of Naturalization, Certificates of Citizenship, Declarations of Intention to Become a Citizen, foreign passports. A Georgia notary public has the authority to witness or attest signatures on documents; witness affidavits, take verifications, take acknowledgements, and administer oaths and affirmations. A Georgia notary public has the authority to make a certified copy of a document provided the document presented for copying is an original document and is neither a public record nor a publicly recorded document. Documents which can be copied and certified by a Georgia notary public include: business transactions, school diplomas, personal letters, a social security card, insurance policies, accounting statements, contracts, lease agreements, invoices or bills of sale, student permission forms, consent to give medical treatment forms, living wills, and consent to travel forms. A Georgia notary public is not authorized to certify the authenticity of photographs. A Georgia notary public may make a certified copy of a U.S. Passport using the passport holder’s affidavit and certified copy guidelines provided by GSCCCA.